A short drive from RIO de Janeiro, birds, turtles and other animals born in the wild must be nursed back to health after being hunted and sold illegally as domesticated animals. The IBAMA Treatment Center rescues thousands of animals each year and then releases them back into the wild. 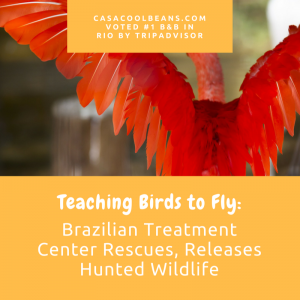 Read on to learn more about the unfortunate impact that trafficking has had on wildlife in Brazil and the touching efforts of the IBAMA team, environmental police, and other groups to put an end to this practice.